By the end of my teaching career, I felt like I was hanging on to my chalkboard by the tips of my fingers. Every year, my principal tried to persuade me to trade it in for a brand new, shiny whiteboard. And every year, I politely declined, insisting I needed my chalkboard. Perhaps you think I’m just nostalgic about chalk dust. Actually, not at all! But using chalk on a chalkboard does produce a drag which provides sensory input. Compare this to the smoothness of a marker on a whiteboard. 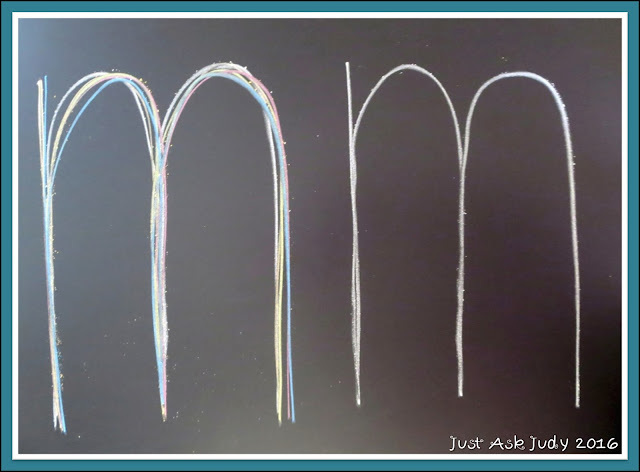 My chalkboard was an essential tool for teaching letters and sounds using a multi-sensory approach. Some children learn letters and sounds easily with exposure to alphabet books, environmental print, and sound play. Other children require explicit instruction. This post is for teachers working with children who benefit from explicit instruction. Early in my teaching career, I was introduced to Orton-Gillingham methods through my cooperating teacher, a mentor teacher, and professional development. Over time, I drew from a number of resources. 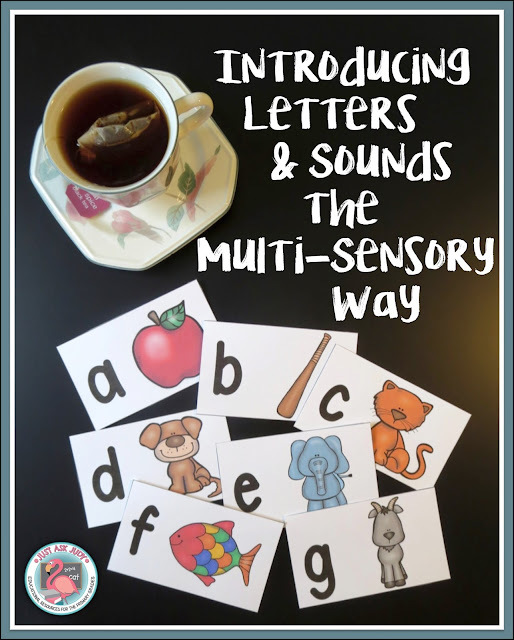 Although the specifics varied across the years, a mainstay in my instructional approach was the multi-sensory introduction of letters and sounds. This approach links the name of the letter, the sound the letter stands for, and its formation. The University of Oregon’s Big Ideas in Reading lists an acceptable sequence for introducing letters. This sequence is geared towards introducing reading and spelling after a handful of letters are taught. They also provide criteria for evaluating a given sequence, which is helpful for developing your own or determining the suitability of a required sequence. 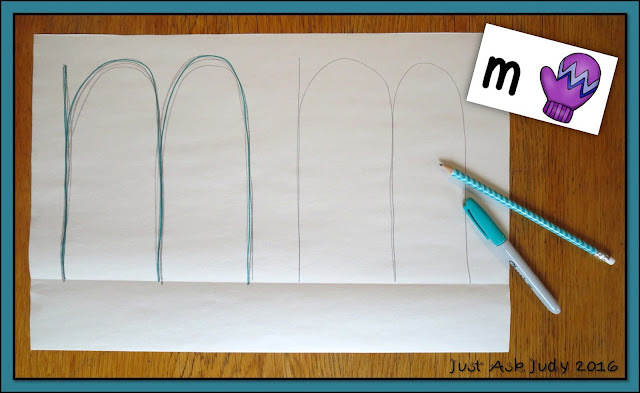 For children primarily needing handwriting instruction, use a sequence based on groups of handwriting strokes. You will need a set of letter/ sound picture cards. Each card should have a letter and a key picture representing the sound the letter stands for. The pictures need to represent single initial consonant sounds, initial short vowel sounds, and final x with the /ks/ sound; in other words no frogs, owls, or xylophones. I am sharing a set of letter/ sound picture cards which you can download for free. These cards present lowercase letters only as this is potentially less confusing and they have a higher utility for reading and spelling than uppercase letters. These activities are most appropriate for individuals and small groups but can be adapted for large groups. Keep in mind that a letter’s name is its most stable property. Its form and sound may vary. Introduce the letter/ sound picture card by naming the letter, naming the picture, and saying the sound (a- apple- /a/). Have your student repeat. Write the letter large, as large as your student’s arm reach, on the chalkboard (okay, whiteboard, if you must) stating orally how it’s formed. Have your student skywrite the letter by standing and facing the board, extending his/ her dominant writing arm with the elbow straight and stiff, pointing the index and middle fingers together, and grasping the upper arm muscles with the non-dominant hand. Skywriting should be a large muscle movement, as large as an individual’s arm swing from the shoulder allows. Have your student skywrite and name the letter while looking at it. Follow this by saying the keyword and the sound. Provide guidance, as needed, by modeling while you face the letter or by standing behind the student and providing light touch. Repeat several times. Remember that you are building connections between the letter name, its formation, and the sound it stands for while using the visual, auditory, and kinesthetic senses. Next, have your student trace your large letter model while saying its name, key word, and sound. Repeat several times. Use all white or a variety of colored chalk. Lastly, have your student write the letter, arm swing size, next to your model. This activity can be adapted for groups by writing the letter multiple times on your board(s). Some students can skywrite while others trace and write on the board. Be sure to read this post by The Inspired Treehouse, which explains why kids should have opportunities to work on a vertical surface. Start by reviewing the recently introduced letter/ sound picture card. Name the letter, the key picture, and the sound the letter represents. Use 12 x 18 inch unlined newsprint in a hot dog/ horizontal position for this activity. Fold a baseline along the bottom. Allow more depth for “tail” letters. Write the letter large with a marker. You might want to use a chisel tip for bolder lines, giving a wider margin of error. Have your student trace the letter while naming it, the key word, and its sound. Repeat this multiple times. Have your student write the letter next to your model (the number of times will depend on space). Review the recently introduced letter/ sound picture card. Use a chalk liner (or marker liner) to make handwriting lines on the board. I use blue, red, and green lines. I double the size at this point using the top and bottom slots of two chalk liners. 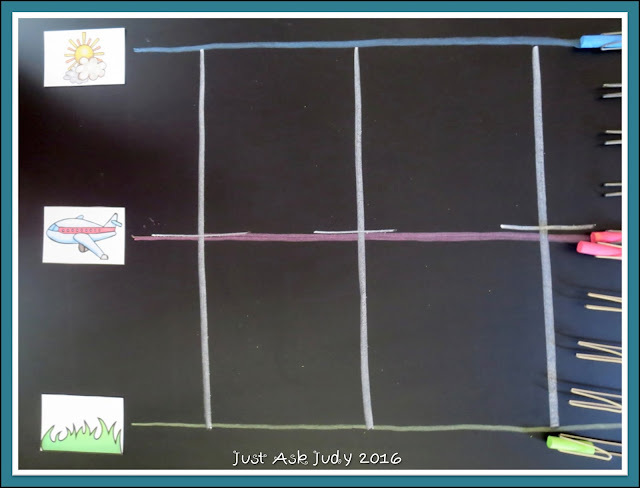 I use the sky line, plane line, grass line and worm line terms from the Fundations Teachers Manual Levels K-1, along with their Letter Formation Guide. I have shared the pictures I use on the chalkboard in the free download. I write the letter on the lines while verbalizing its formation. I repeat this 3 to 5 times. Your student traces the letter while (you guessed it) naming it, the key word and sound. Your student writes the letter on the line using any remaining space. I use one activity each day. The amount of repetition needed to learn a letter and its corresponding sound varies from child to child. These activities can be repeated. I also use 9 x 12 inch manila paper with a, large as the paper, model letter written with a marker. Your students can rainbow trace with crayons using the same procedures. There are many ways to review and practice the links between the letter name, its formation, and the sound it stands for- too many to list here! I plan to continue with Part 2 in the near future. Judy I love this!! I am just finding you blog and definitely will be looking around a bit. Thank you! Oh, Judy, how serendipitous that I came across your site today! I face losing my long, green chalkboard to a whiteboard tomorrow. Thanks for your information.